Looking for a breeder in your area? Contact the specific breeders listed below for the latest information on their litters. 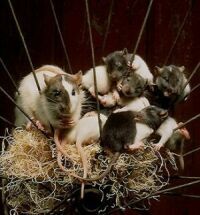 Please note that we have not personally checked these breeders and are only providing this listing as a service to rat and mouse lovers. We cannot make any guarantees about the health or temperament of rodents from these breeders. The RMCA is no longer providing breeder listings; please visit our links and resources to find a breeder or rescue in your area!